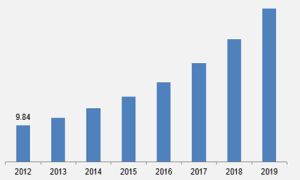 The global reinforced plastics market stood at US$8.42 bln in 2012, expected to reach US$15.82 bln by the end of 2019, growing at a remarkable CAGR of 7.6% from 2013 to 2019, as per a report by Transparency Market Research. Based on product type, the market is segmented into glass fiber reinforced plastics (GFRP), carbon fiber reinforced plastics (CFRP), aramid fiber reinforced plastics and others (including natural fiber, metal fiber, graphite, and boron). Due to low cost and availability, GFRP is the most widely used product in many applications. Reinforced plastics also finds its use in numerous applications such as aerospace and aviation, automotive, electrical and electronics, wind energy, building and construction, marine, and others (including tanks, towers, pipes, and biogas digesters). Geographically, North America dominated the global reinforced plastics market in 2012. The region accounted for 35% of the global reinforced plastics market due to high demand from the construction and building industry. The report also estimates that by 2019, Europe is expected to witness high growth in this market due to stringent regulations to reduce CO2 emissions in vehicles. 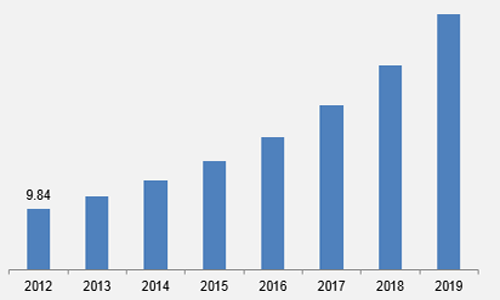 By 2019, growth in the reinforced plastics market will also be seen in Asia-Pacific and reach US$4.73 bln.